The 5:16 AM sunrise over the Egan Range begins to warm Dacey Reservoir. You know when a strong impulse causes you to do something you've wanted for a while, and so you wedge it into your schedule? Then the truth is discovered that allowing the urgency of desire to squeeze an event into your calendar before all conditions are at least reasonable often produces undesired outcomes. I frequently observe that our childish nature seeks immediate indulgence which in turn causes poor planning and unhappy results. If you maintain a healthy dose of reality you can cope with that; if you're too optimistic you may come away disappointed. I won't say that this trip to Wayne Kirch Wildlife Management Area (Kirch) was disappointing, because it wasn't. But it did contain a couple preventable mishaps. The Fish Taco being unpacked in the early morning light in preparation for the 6:00 AM launch on Dacey. The small cottonwood stand on the horizon to the left of the truck marks the Dave Deacon Campground. The primary purpose of this adventure was to measure the Fish Taco's performance on its first out-of-town trip, and to camp overnight sleeping in the Leer truck bed shell. I always intended to use the shell on my Dodge Dakota as a sleeping quarter, but I never worked that into my fishing trips. Both the Tacoma and the Dakota have short five-foot beds, and although cramped I envisioned sleeping diagonally could work reasonably well. I had given up pitching camping tents on overnight solo trips, preferring to stay in cheap motels instead. Unfortunately, the motels are not usually conveniently located next to the water I'm fishing. 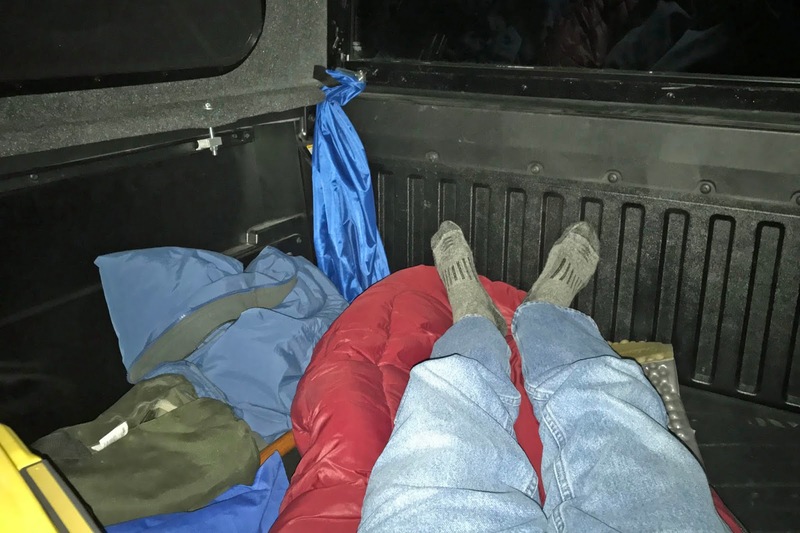 Sleeping in the truck shell eliminates unnecessary travel time as well as saves a few dollars. But I also wanted to fish Dacey Reservoir this spring before the heat and weed beds took over. Fishing was my secondary purpose, and so I was watching the Kirch area weather. High winds had been the dominant weather pattern for about a month. The forecast for Kirch was five to ten MPH winds on Friday and Saturday, so that became my target window. However, my wife had a medical appointment on Friday at 2:30 PM that she didn't want our young daughter to attend, and I had a noon appointment on Saturday which was also our designated day to babysit our grandson. I reasoned that if I left for Kirch at 6:00 PM Thursday I could sleep overnight in the shell and get myself on the water by 6:00 AM Friday. It would be a fine first run for the Fish Taco. I'd test out the sleeping arrangements in the shell and get at least five hours of fishing time on Dacey Reservoir before the return trip home. It all seemed reasonable to me, and it was. Adams-McGill Reservoir towards 7,050-foot Gap Mountain on the left. The trip was not without a few misfortunes along the way. Planning and packing for an overnight trip, an admittedly simple trip, is different than a day trip. I'm not usually a list maker, but that might have been a useful thing to do. I was more focused on the overnight aspect and less on my fishing accoutrement. In my rush to get on the road I left behind my favorite Galvin reel case. After arriving at the Dave Deacon Campground I ate a light meal and shuttered myself into the Leer shell. I decided to attach a new 4X leader on my reel before going to sleep... which was when I discovered I forgot the Galvin reels. In desperation I searched through my Fishpond bag. In there I found my old Hardy HRH lightweight reel sporting a click-pawl drag system loaded with 5-weight line, and my Orvis Access Mid-Arbor reel with a 4-weight line that used a disc drag system. 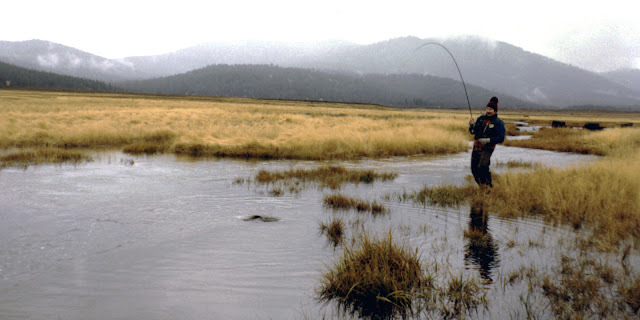 I opted to use the four-weight Orvis with my eight-foot, five-weight rod reasoning that its drag system would be more useful than the heavier line weight on trout that often approach 20 inches (I brought two fly rods, one nine feet and one eight feet, both being five weights). I felt stupid for having left behind my Galvin case, but I had a backup solution that would be very workable. was a healthy 16 inches. I arose before sunrise to the tweeting of camp birds and what I think was the hooting of an owl. About four years ago I saw what I believe was a Great Horned Owl in the cottonwoods shading the Deacon Campground at twilight, so that's what my brain locked on when I heard the hooting. Shaking off the sleep and stretching old muscles and joints, I extracted myself from the Leer shell. As planned I arrived at Dacey Reservoir just as the sun was peeking over the Egan Mountains, and I launched the Water Master Grizzly at about 6:00 PM. Passing by the bulrush that sheltered the launch area from the winds I quickly noticed the wind was stronger than I had hoped. I needed to use the oars to get out on the reservoir, and while casting the fin-kicking was a constant battle. I did catch three largemouth bass of smaller size, and one handsome rainbow that was a plump sixteen inches. I had one other hook-up that I think was a trout based on the way it fought, but that hook pulled out before I could know for sure. Over the next few moments the wind seemed to pick up strength. It was coming from the north, the usual direction for the White River Valley that holds the Kirch waters. White caps were becoming visible, and I was letting myself get frustrated with the circumstances. If I had the whole day ahead of me I'd have gotten off the water to wait and see if the wind would subside, but since I had to be on the road home by 11:00 AM that plan was met with impulsive resistance. Then there was the mismatched line (4) and rod (5) weights that when combined with the wind conspired to continually tie my leader into knots. After an hour of fishing I decided to pull the plug early. Landing four fish in about one hour was a reasonable expectation at Dacey, and I knew there were larger trout to catch. But I reminded myself the primary purpose was to test the truck and camping shell; the fishing was secondary. The waves on southern end of the reservoir were getting taller, and my rowing direction back to the launch site was parallel to the waves such that the Grizzly was getting rocked side-by-side. In my stinking thinking I was still balancing the idea of leaving the water early against the desire to make those "last casts" on the way out. But the rowing was relentless to avoid being pushed against the dam riprap stones, and so I never made those final casts. and pulled my fly rod to its depths while I was rowing back to the launch area. As usual for me, I had reeled in the line and laid the rod against me in the Grizzly. The watercraft does have tie-downs to secure your rods, but they aren't all that convenient, especially when thoughts of "one last cast" are playing in your mind. I was rigorously rowing hard forward; that is, I was facing where I was headed as the wind pushed from my right side. The reel was next to my right leg with most of the rod tip extending out the back of the Grizzly. This arrangement was nothing new; it was familiar to me. After a few moments of rowing with splashing waves striking the Water Master’s right side, I looked down and my rod and reel were gone... I believe what happened was a twelve-inch wave grabbed the rod and pulled it over while I was preoccupied with my rowing. The rod meant more to me than the reel only because I built it by hand (most all my rods are custom built by FisherDad). It cost me about $250 in parts and about four days of labor to build. The Orvis reel cost under $200, and the full-sink line about another $60. So, there's about $500 of rod and reel "sleeping with the fishes" in Dacey Reservoir. I’ve always found hope in Jeremiah 29:11 since although my plans might be feeble in the eyes of the Lord, knowing that He has plans for me is eternally comforting. My problem, and I suppose most Christians’ problem, is that we still want control. We want to tell God where we are best utilized in His kingdom. Maybe we’re afraid His plans might be overwhelming so we prefer our own, falsely believing that we can pretend our plans are better for us than those of the God of all. Perhaps we don’t truly believe that He can use our weaknesses for His gain; we don’t believe the Holy Spirit can empower us beyond our limited imagination. Maybe we just want what we want, like an unruly child. I do know that except for Jesus, every person in the Bible resisted God’s plans starting with Adam and Eve through Moses all the way up to the disciples of Christ. Knowing I’m in good company doesn't make me feel better; I don’t like being accountable for my mistakes… who would? While “prosperity” and “poverty” have financial definitions, they clearly have spiritual meaning in the context of heaven and hell. And of course, losing $500 worth of equipment every time I go fishing could eventually lead to financial poverty as well (smile). to spare. I'm going to enjoy my adventures in this truck. So, as to my primary purpose, I can say the Tacoma was a pleasure to drive, especially compared to the Dakota. I had it on cruise control most of the trip, and it did downshift as expected on the longer, steeper hill climbs slightly more than the Dakota. While the 3.5L Tacoma has more horsepower than the 4.7L Dakota, the Dakota has more torque. But the Tacoma is a much smoother ride, and I was really pleased to see it achieved 22.1 MPG fuel efficiency compared to the Dakota's usual 18 to 19 MPG. When I reached the dirt roads of Kirch I put the transmission into four-wheel high range just for the heck of it. What I noticed was a much more balanced suspension and less drifting on the corners as compared to the Dakota. The Tacoma feels like the right truck for me. Getting comfy in my Leer shell for a night's sleep. My body does fit in the 5-foot bed if I lay corner to corner. As for the camping, I was a lot more comfortable in the shell than I imagined. I did have to lay diagonally in the bed, but the combination of the bed liner, foam pad, and decent sleeping bag made for a reasonably good sleep. I was warm at first, but awoke to a cold face around 3:00 AM due to the overnight low of 41 degrees. I simply tucked my head a little deeper into the bag and went back to sleep. My little MSR propane stove can handle my needs on solo trips quite well, and the 12V sockets in the Leer shell are very useful for electric float tube inflation and recharging phones, cameras, and other devices. I can see me using this arrangement for overnight trips, but also more extended trips into northern Nevada. I have a childhood connection to the northeastern Nevada Jarbidge Mountains from a bow hunting adventure with my brother Neal in the early 1970s. The Jarbidge River, which feeds into the Snake River – Columbia River drainage, still holds native bull trout. And the Mary’s River has a population of Lahontan cutthroat trout. Although not large fish by some reservoir standards, catching and releasing these threatened trout species in wild settings would be a “bucket list” item for me. for the good of those who love God and are called according to his purpose for them." Just the Lord, me, and my Fish Taco. Like many of you, I can't resist the gratuitous livestock pictures when traveling rural areas... I just don't see much of it in the urban and suburban neighborhoods of my metropolitan area. I always enjoy reading your blog and seeing you in your element. The cows were a new photo diversion and youre right about not seeing them in the urban jungle. It’s different here in Texas. We have goats, horses, long horns and cattle in the undeveloped acres of landed in the urban areas which is one of the things I love about Texas. We have goats along our walking trail in my neighborhood. Of course having farm animals on your land gives you a giant tax break so this charm won’t last forever. Thanks Kathy! As to the livestock, I embellished a “little” (don’t all anglers embellish?). Living in the northwest valley near the rural preservation area I do see cattle, horses, goats, and chickens within a few miles of our home. In fact, there’s a couple-acre ranch less than a quarter-mile from my house located in what’s known as a “county island,” i.e., it was there before residential development engulfed it. But still, it’s great to see them on the open range as compared to what now appear as suburban pens. I never would have thought sleeping in a 5ft bed would work. Surprised, but glad to hear it worked for you. Do you think you'll keep doing it or try another set-up? As always, good to read and see your adventures. Mine are a bit less frequent but I do draw inspiration from yours. Thanks. Sorry to hear about the gear. 2. Learning how to scuba dive in order to find your wonderful rod/reel that is currently 'sleeping with the fishes'. Thank you for the encouragement. Yes, I think for now I'll stay with the current setup. Living in the ungodly heat of the Mojave Desert I like to park my truck in the garage. The current truck/shell combination fits in there just right. And as to the 5-foot bed, being just 5'5" helps a lot... LOL. I don't do long trips; one or two nights is more my target. Although cramped I think it'll work. May add other gear, and possibly truck mods, as I go along. I'll be sure to write about those. Yes indeed! Ironically, somewhere I have a Velcro strap with a tether that can be snapped on one on the Grizzly's many D rings. I will be digging it out of my gear bag and attaching it on my next trip. Over 40 years of angling and this was the first time I've lost a rod and reel... maybe the "old dog" can learn new safety tips. Thanks for sharing your overnight adventure with us. 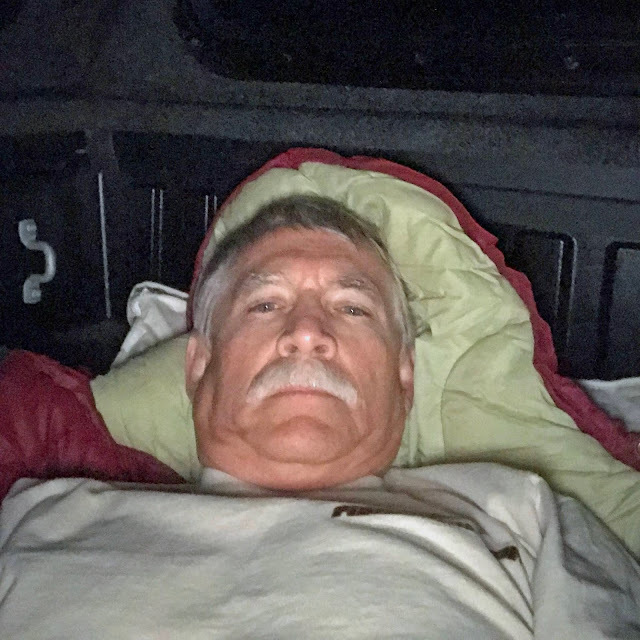 I sleep in the back of my Jeep Wrangler JK (four door) with a mattress and sleeping bag set up too and like it much better than sleeping in a tent when I go fishing in the Sierras. At my age, I've decided to enjoy a little more comfort and safety in the Jeep. As always, your discussion of eternal matters is a blessing and encouragement to me. Thanks for taking the time and effort. Your words and verses inspire me and countless others who don't comment. I've been following you since your Beaver Dam posts. Sounds like you are enjoying your retirement (The City is still that great place to work). So nice of you to post your comment. Before I retired you had mentioned to me that you read the blog. I'm blessed that the words the Holy Spirit provides on occasion (i.e., when I'm "listening" to Him) provide reassurance to those seeking the Truth. Yes, the city of LV is a great place to work, and the work is meaningful. It directly benefits the community in which we live. The politics (i.e., real "politics" not the office type) is never fun, and it will never go away, but when you refocus on being the best servant worker to our community it makes everything much more bearable. If you think of it, tell Jerry, Steve, and the gang I said hello and that I miss working with them. I’ve never commented before but I love your verses and scriptures you quote and really enjoy the magnificent and pretty fish you catch me my dad and the bishop of our church are going to sand hollow Utah to chase bass this Friday afternoon should be fun! I also am like you we spin fish and catch a lot of trout mostly we go to baker reservoir which I’m sure you know all about it 😉 but the first bass I ever caught was on a black rooster tail in sand hollow and fought pretty good despite it’s size but if you see this comment I’ll let you know how the fishing went up there. I appreciate the last two "unknown" posts. Our hobbies are wonderful gifts from the Lord, but they are never to replace Him; I must admit that my scripture references are usually for my own benefit, as if I'm talking out loud to myself. I hope your Sand Hollow trip was a rewarding time with your father. And yes, I have fished Baker Reservoir once (scroll down my blog to below my short bio and picture, below that on the right side you'll notice "Destination Blogs." There you'll find an alphabetical listing of the waters/subjects I've written about. Click on any destination that strikes you're fancy and the site will return all related blogs in reverse chronological order. You can also use the "Search This Blog" search engine at the top of the page to find things of interest outside the blog labels (e.g., bible verses).